At Platinum Recruitment, we love to support those who may not be so fortunate. Each month we donate to a different charity, chosen by one of our dedicated team. Each of our top hospitality recruiters and internal staff donate £1 a week of their monthly salary, Platinum matches this amount and then doubles it. A Platinum team member is then chosen by random and they get to decide where the donation is to be made. Our lucky winner this month was Charlotte from our Front of House team. 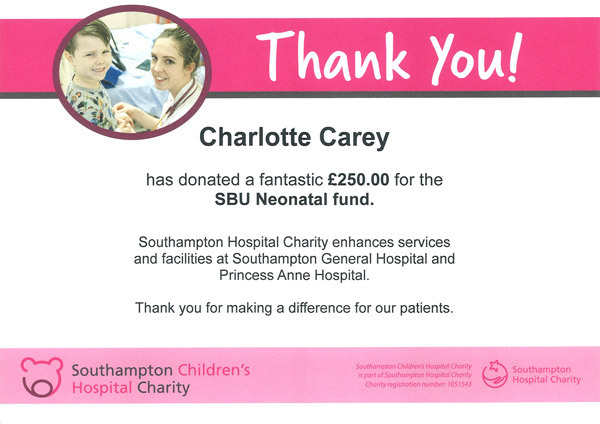 Charlotte’s chosen charity is the Southampton Neonatal Intensive Care Unit (NICU). Those who work in the amazing Southampton NICU support both sick term and premature new-born babies with their incredible specialist care. The Southampton Neonatal Intensive Care Unit is designed to be a welcoming and comfortable environment for both babies and their parents. This state of the art facility is one of the UK’s largest neonatal ICU’s and treats babies from all across Southampton, Bournemouth, Chichester, Dorchester, Basingstoke, Salisbury, Winchester, the Isle of Wight and the Channel Islands. It provides 23 intensive and high dependency cots and 14 care cots for babies requiring specialist care and attention. Every cot has its own monitoring equipment, so medical staff can respond quickly to any changes. The unit also has parent and carer facilities. The Southampton Neonatal ICU is now fundraising to acquire a modified neonatal ambulance to transport sick or preterm babies to the hospital safely. The ambulance will help reduce the time to make transfer arrangements, provide a streamlined service and give poorly infants and babies full intensive care to and from the unit. This specialist ambulance will cost £120,000. The charity has already raised an outstanding 58% from supporters, but more is needed to reach their final target. To learn more about this fundraising project for the Southampton Neonatal ICU, please visit their website, Facebook or Twitter pages. If you would like to kindly donate, please visit their Just Giving page or call the charity team today on 023 8120 8881. To find out more about our range of chef jobs, hospitality jobs and all other vacancies, please email the Platinum Recruitment team at hello@platinum-hospitality.co.uk or call us on 01202 203 150.